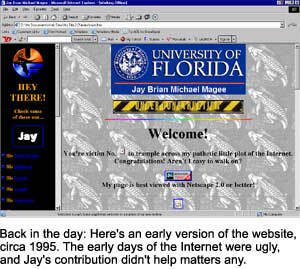 The Paleolithic ancestor of Jaymagee.com crawled out of the primordial Internet tarpits in 1994 at the University of Florida. Since then, my website has gone under the knife quite a few times and has served blogs, thousands of party photos, resumes and cheeky op-eds on just about anything and everything. It tried to be all things to all people, and quite often, it succeeded. In January 2011, after two years of darkness, I reinvented Jaymagee.com as a WordPress.org blog site. This time around, I’m approaching the site with a narrower focus. Several times a week, I’ll bring you stories of my life, lessons learned and the amazing people who come across my path. I’ll cross-post these stories to my Facebook and Twitter accounts, so you have no excuse to read and comment. Perhaps the question of the day and the reason you’re on this page: Will I bring back the thousands of photos taken over the past 10-or-so years? No, I won’t. Part of it is the time and labor involved in reposting all of them, and another part of the equation involves privacy. There are plenty of photos I would prefer to keep under wraps, as favors to friends who probably wished I hadn’t taken them. Chalk it up to growing up. However, you will find on every page of this site a rotating gallery of some of the best photos I’ve taken since 1999. I can’t completely abandon my shameless shutterbug roots, after all. I’m glad you’re here. Thanks for taking the time to read this.